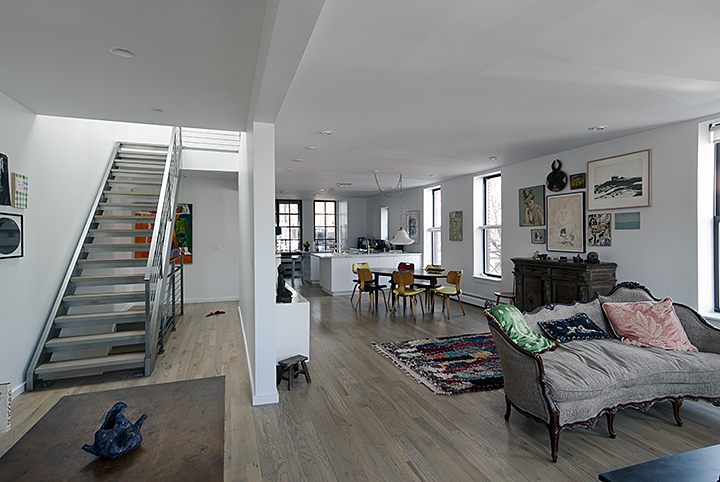 A three-story mixed-use corner townhouse was renovated to provide open living and workspace for a couple relocating to Gowanus. The lower floor contains a painting studio/gallery at front and tech office at back. The second floor is fully open with a living room at front and kitchen at rear, opening to a big exterior deck. The third floor has a master bedroom suite plus two guest bedrooms with a media space between. A large skylight was added above an airy staircase, bringing day light to the middle of a living area already boasting three exposures. At the owner’s request, interiors are simple and white, to focus attention on their collection of art, books and furnishings.